You might have experienced your colleague or your friend complain about having to work overtime. Don’t get too carried away by their impressions of the work. You cannot judge that, the tasks were too tedious or that it required more time. It rather requires more investigation about their ‘habits’ and find out if they are really bad. If it is considered bad, then it is possible to change them if you put your heart to it!! So how does ‘Bad habits’ affect our brain and in turn our working style? Scientific experiments like using rat running through the maze to reach its destination –‘the chocolate’, brought in more details about being habituated. Though the rats took more time at initial stages to get to the chocolate, through frequent exposure to the same pattern of maze, the rats spend less time. It was further explained that the neurological activity of the brain turned out to be high in the beginning and then began to slow down. With this it is obvious that by automating our brain, the mental activity is slowed down or drops. But then, is it really bad? Maybe not always. For instance, brushing your teeth or having a shower or completing your morning tasks happens due to habit and definitely does not require you to think. These habits are ‘good’ as it allows time for you to focus on creativity and planning your day ahead. Consider the other way round. Imagine sitting on your table with a huge file to be entered but instead, you are figuring out what to input into your social media page or just got gloomy thinking about the fight with your partner the night before. This hampers your work and delays the entries pushing you to work overtime. Coffee time is break time!! Sometimes, you may be habituated to taking a coffee break at 3.30 pm, getting up from your seat and moving down the aisle to cafeteria. These breaks mostly don’t last for only 10 minutes, it takes more than half hour. You are surely addicted to such breaks and cannot break your rule!! You have been assigned a big project but you just couldn’t finish your work as per schedule. You may have habit of looking into small stuff while you may not be aware of how much time would have been required for each part of the project. By paying attention to trivial matters, it is possible that the big picture is not deciphered properly by you. Some people never feel optimistic about any work they do. Such personalities always have a comment for every task or would pass on a remark slowing down the work. These people are habituated in giving negative remarks or brings down the morale of their counterparts. With internet browser given to every personal computer on each desktop, it is always tempting to surf the internet for personal reading or for personal matters. If your workplace gives complete access, you may have the habit of frequently searching internet for downloading matters you are interested in. Having to work out on various tasks in a workplace, missing the deadline shows your commitment to organization. Falling into the trap of bad habits, you get lured into false declaration about deadlines and miss out on them. If you are always late in coming to work and put the blame on outside forces for such deeds, it causes distrust on your ability. Coming late is caused by habit of getting up late or not prioritizing your work in the morning or could be that you don’t plan what you need to do the next day. Besides, coming late disrupts your normal schedule and pushes you to perform haphazardly. There are some people who love to be humorous while at work. But you need to see if it does not go overboard. Inappropriate humor at the wrong time can cause disruption to work and waste time. With having access to internet, it would provoke to check out on mails frequently. But, without having a fixed pattern or fixed time, you would be wasting your work time by reading mails. Addiction to some bad habits causes one to fall sick and waste productive time. For some, smoking in a work place is caused by fellow workers joining together. 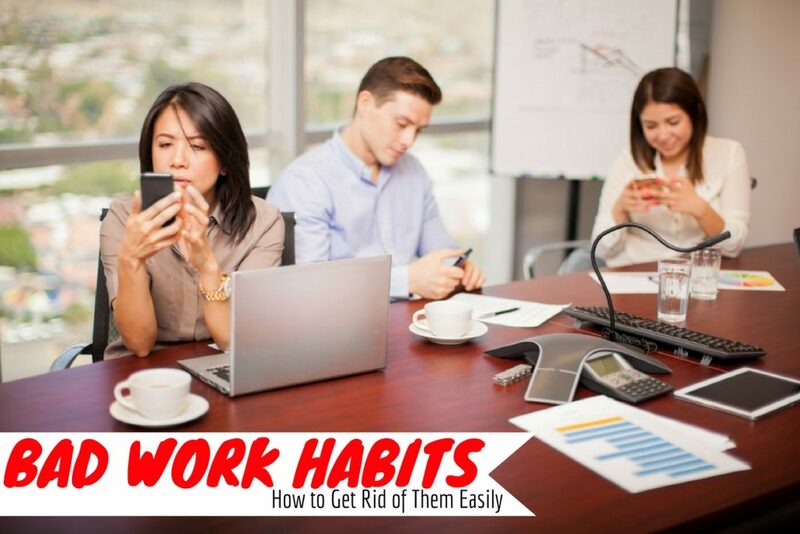 These are some of the ‘bad’ habits that gets you slowed down and make you to work beyond work hours or overtime. The next question is about how to handle those habits? This is the first stage of making changes to yourself. List out what you consider as bad habits that causes hindrance to your progress. Just as mentioned above, make a list and note how you respond on those habits. Once you know those habits, you would need to further take note of the time spent for each habit and observe for a week. Make note of the average time spent in each case. Keep track of any unaccounted time that goes waste and make note of it. Having those listed habits with time spent, its better to review them for two weeks. It helps to find solution to make changes and also to know where to make those changes. Moreover, it also instigates to get rid of some of them. It sounds easy, but it is not very easy to do so. It requires lot of courage and confidence to find right solution. Take it easy and move step by step before achieving your goal. Don’t try to push yourself to eliminate all at once. It is impossible to change yourself or make changes to habits which has been part of you for some time. Thereby try working out on one habit a time and see the changes. In case of some habits that cannot be removed from you, try to replace them with more important tasks or reschedule those task timings. This would help to reduce time wastage. Making changes to oneself is not easy as said. You need to allow time for having to experience the change. Mostly, it could go up to a month. But just don’t give up and Keep yourself on track. Even you have been able to make only 25% of change, give yourself a pat on your back. It is a great achievement and you need to feel proud about yourself. These small changes would surely impact your productivity. Once you realize that you are prone to go back to your old habit, then figure out an alternative plan to bring you back on track. Sometimes having lost in fixing yourself, you are easily prone to reverting to your old habit. So, figure out an alternative plan B to keep you motivated. Some habits that involve electronic appliances can be corrected by installing special programs or apps to hinder or block you from accessing those devices that waste your time. It helps one to concentrate better so that diversion is deviated. In case your thoughts are mostly negative, think about the reasons behind it. It could help you to uncover the main aspects and try to make changes. Get to the core of the reason to find alternative ways of handling it. In case you are frequently checking your mail or coming late, then make changes to your settings on the computer or clock. Trigger the alarm setting for checking mail from 1 to 2 hours once, so that you can continue without disruption. If you seem to be late often, then make changes to clock setting giving an indication of 15 minutes ahead. You may be aware that foregoing a bad habit will take time. But without a strong will power to see changes in yourself, you would be alienated from self-progress. The will to make changes is predominantly required for any individual to get ahead in life. Seeking support from colleagues and family friends, would give you confidence and support to move ahead. Explain to them about your schedule and what you intend to change, you are sure to get all the support you can. Failing to achieve what you wanted, would immediately cause disappointment. Such disappointment leads to giving up. By doing so, you are going to be counterproductive to your goals. Therefore stay focused and try to achieve what you intended to. By looking at the aspects indicated above, you would be familiar with some of them to get into your brain and make those changes. Habits are part of our life and got installed in our system at some point of time or other. As some of habits are beneficial, some are not, pick out the beneficial ones and try to work out on the others that causes disruption to your work and life.